We rarely review VPNs that use a white label service, because what’s the point? If it’s just the same as a service we’ve already reviewed with another name slapped on it, there’s little reason to revisit it. We’re making an exception today by taking a look at Webroot’s WiFi Security, which is based on an enterprise product called Perimeter 81 from Tel Aviv-based SaferVPN. When you first see Webroot WiFi Security there’s no doubt about its SaferVPN roots. 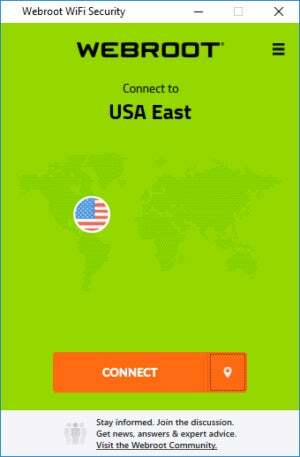 The application is almost a carbon copy of SaferVPN, with some minor differences in color and messaging. We won’t go into too much detail about Webroot’s app as we’ve already taken a hard look at it its foundation in our SaferVPN review. In summary, the app is simple enough to use and lets you choose from a good number of locations. What sets Webroot WiFi Security apart is that it uses its own BrightCloud Threat Intelligence service to keep VPN users safe online. Webroot doesn’t quite have the full server offering of SaferVPN, with just 36 granular location options instead of 40. The difference is that Webroot isn’t offering any of SaferVPN’s P2P server options, which means WiFi Security is not for anyone who wants a VPN for file sharing. It also lacks SaferVPN’s U.S. streaming servers, but it does offer UK streaming. Diving into settings, Webroot doesn’t offer the OpenVPN protocol option that SaferVPN does, opting for IKEv2 by default, and then also offering L2TP over IPSec and PPTP. There’s also the option to connect automatically, a whitelist for networks you don’t want to use with a VPN, and a kill switch to stop internet traffic when you lose connection with the VPN. 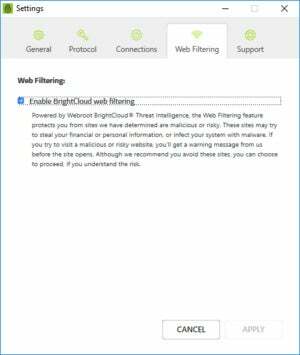 Webroot’s settings also have the option to disable BrightCloud web filtering, which is enabled by default. BrightCloud’s web filtering can be turned off from Settings > Web Filtering. BrightCloud is the key difference between Webroot and its progenitor. So what is BrightCloud filtering? It’s basically a beefed up version of site filtering that acts as an extra layer of protection against malware that you may run across online. If Webroot detects a site as risky, it will throw up a warning similar to the Chrome web browser, but if you still choose to go ahead and visit the site, Webroot will allow you to do so. Webroot isn’t the only VPN service to offer this kind of monitoring, F-Secure’s Freedome and NordVPN also do, but it is uncommon. In our tests, which took place at different times over three days, Webroot scored significantly lower than SaferVPN, retaining around 26 percent of the base speed—that’s close to half of SaferVPN’s performance. That said, speeds were very good in the United States, often around 50 percent of the base speed. Speeds were also pretty good for the UK and Australian connections. Webroot is based in Broomfield, Colorado. The company’s business address is 385 Interlocken Crescent, Suite 800, Broomfield, CO 80021. The CEO is Mike Potts and Chief Technology Officer (CTO) is Hal Lonas. All of this information is available on the company’s about page. These are similar to SaferVPN’s privacy policies—a mix of good and not-so-good. It’s great that Webroot’s policy says it’s not tracking your browsing habits (though that’s par for the course for most VPNs), but you can find VPN services that do far less logging. To sign up for Webroot’s WiFi security you need to supply your full name, address, and email address. That’s a lot of information and is by no means the norm for most VPN services. Webroot accepts payments via credit card and PayPal. Webroot is a fine VPN. Even though its performance was low I didn’t really experience much in the way of incredible delays or poor performance when using it. If you intend to use your VPN for bandwidth-heavy tasks then you might want to look elsewhere. Webroot also isn’t ideal for anyone trying to stay as anonymous as possible. If you just need a VPN for casual web browsing, however, or if you like the idea of an extra security layer for your browsing then Webroot is a good choice.